My online friend Susan Crowell is editor at Farm and Dairy. Today she shared a photo, and a story, of the unveiling of a new historic marker in Fredericktown, Ohio. That’s the home of the original FFA corduroy jacket. That famous blue item goes back to 1933, and it still means a lot to many of us. There’s a mention that the jackets were uninsulated, which should bring forward a memorable shiver from anyone who has ever worn one someplace like Kansas City in November, or somewhere perhaps even colder. The two gentlemen that helped with the unveiling are now 99 years young. They wore some of the original corduroy jackets. 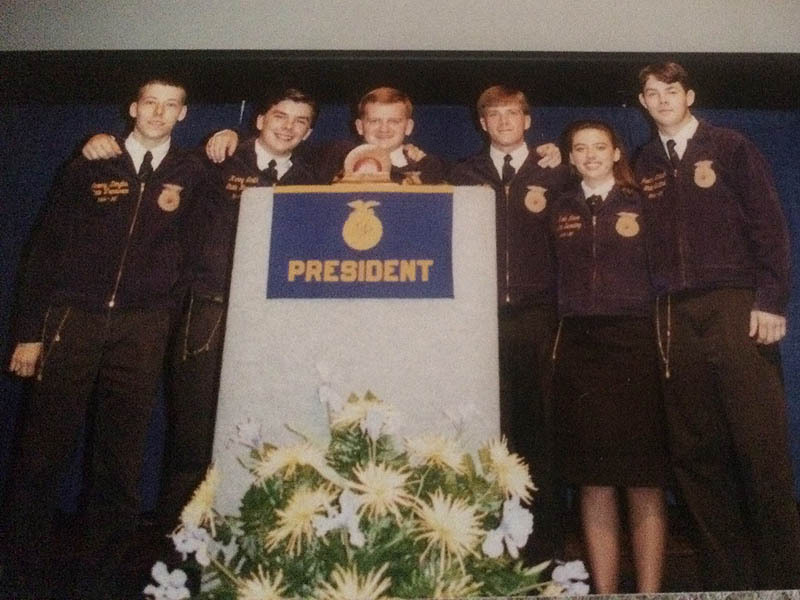 This picture isn’t of those guys, but some of my friends, in some of our last FFA jackets. In retrospect I should have known not to click a @TMZ link curated by @VICE featuring a @neiltyson video. But here I am, watching the neighbor mow his lawn, waiting for another cycle of laundry to be finished, regretting all of this. So you’ve seen the Twitter feed in this post. Be sure to check out Instagram as well. Tomorrow, a bike ride! This entry was posted on Friday, September 14th, 2018 at 9:54 pm	and is filed under Friday, history, IU, memories, Twitter, video. You can follow any comments to this entry through the RSS 2.0 feed. Both comments and pings are currently closed.